The Caramel Cottage inside Summer Park is a great place to visit during the 2015 Tidewater Builders Association’s Homearama Touring Edition. Built by Stephen Alexander Homes, this five bedroom, 3 bath home has historically inspired architectural details and an open living plan with office/bedroom on the first floor. The kitchen has granite counter tops and stainless steel appliances. 1:00-4:00pm come meeting the builder and enjoy treats from various restaurants. 1:00 – 4:00pm see the Caramel Cottage decked out for the Holidays. Enjoy refreshments and get holiday decorating inspiration. 1:00 – 5:00 pm start your Holiday shopping early with Scentsy, Thirty-One, and many other companies. October 31st Meet the Builder. 1:00 – 4:00 pm come meet the builder and enjoy treats from various restaurants. #AskJenLive Recently Visited Summer Park. To read more about this community click here. 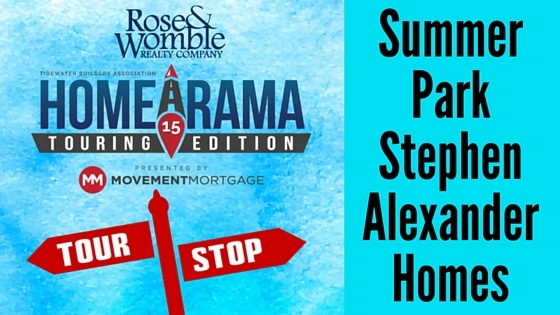 To find out more about Rose & Womble’s collection of 2015 Homearama Touring Edition Homes click here.